Forest Resource Analysis System Software (FRASS) Users create and manage Portfolios. These are unique arrangements of economic and financial variables to be applied to each assessment. Delivered Log Market Portfolios and Real Price Appreciation (RPA) Portfolios, contain specific data to guide assessments. This is the heart of FRASS Economics. Portfolio are applied together to interpret parcel value and establish timber harvest date scheduling. Delivered Log Market Portfolios detail current costs and prices associated with the area where the parcels are located. 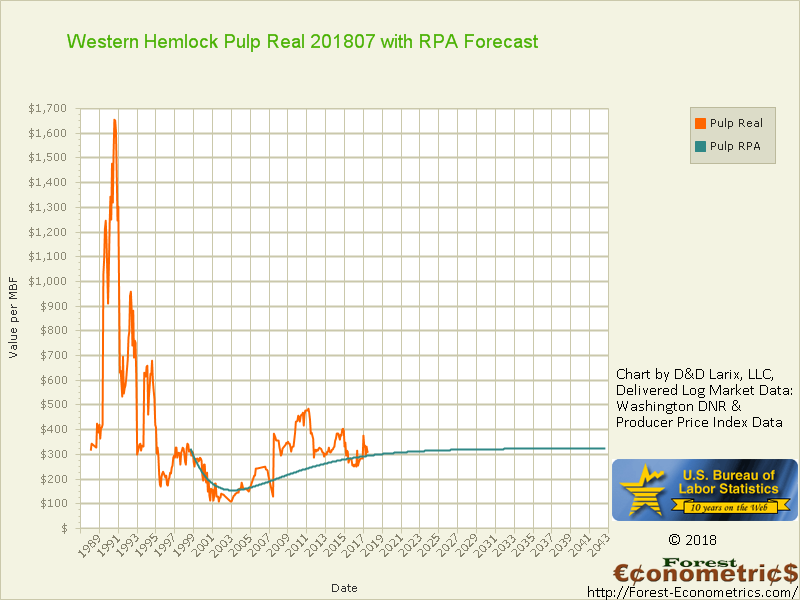 RPA Portfolios give predictions about the anticipated price cycles for each sort. Powerful market assessment tools are developed and implemented in FRASS. 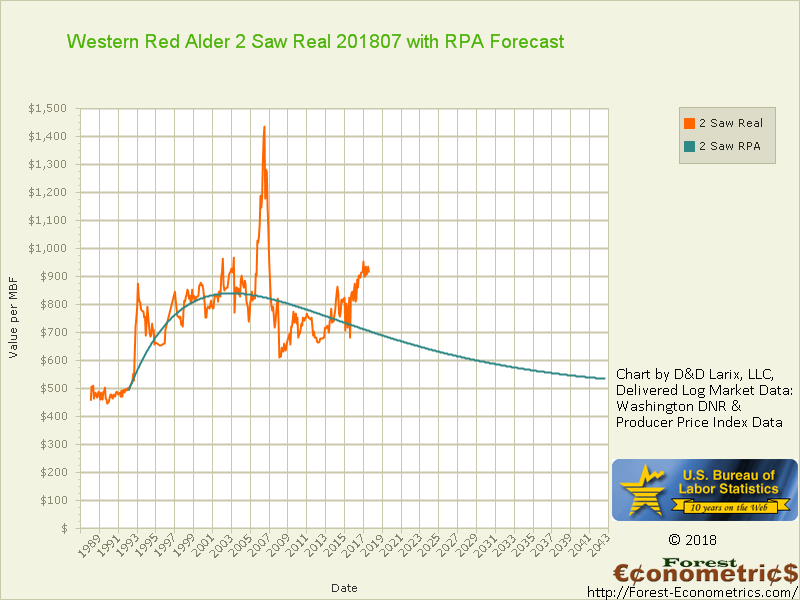 These enable Users to recognize market trends in each log sort and apply them to timber stands on the ownership. FRASS Subscribers can ‘electronically share‘ portfolios with all other Subscription Users seamlessly in the FRASS program. These portfolios can be used, modified, and shared again. Sharing happens within the FRASS Subscription. Only an email is sent to alert the receiving user of the share event. Security and confidentiality are paramount in the FASS Platform. Portfolios can be applied to many land parcels or be created uniquely for individual parcels. Each User can create, and apply, as many Portfolios as desired. FRASS Economics integrates data sharing as a fundamentally powerful tool. FRASS Users can share their Portfolios with other Subscription Users to collect edits or broaden analysis benefits. When the Portfolio is shared, access by the target user(s) happens instantly. The sharing of market portfolios gives the organization using FRASS a synergistic tool for use in forest management decision making. Costs and prices for each sort & grade can be individually set in the Delivered Log Market portfolios. ↑ These Sort and Grade ‘real prices’ were recorded in the Puget Sound delivered log market region of Washington State, USA. 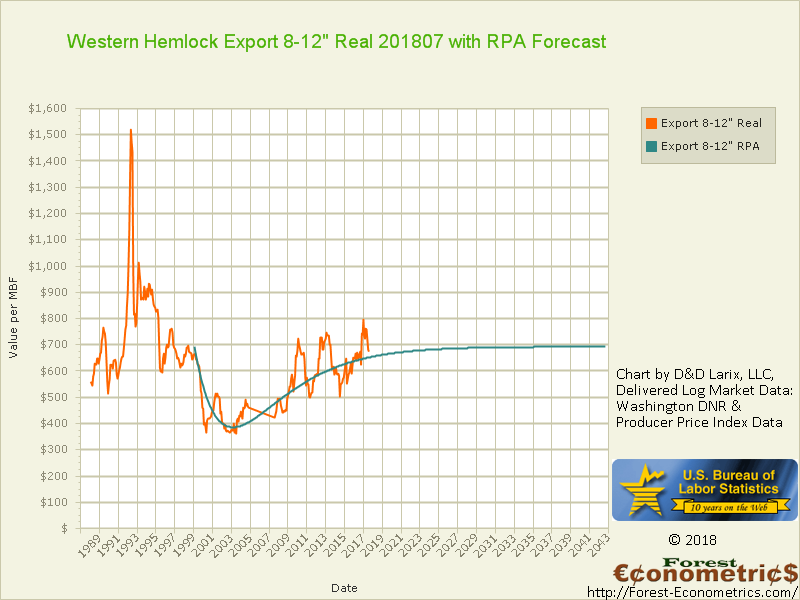 The blue RPA Forecast Tool prediction lines, were generated in this market in 2010. That was 8 years before this graph was generated! This is powerful price prediction mechanics, brought to you only by Forest Econometrics. As a part of the FRASS Price Projection process, Users create Real Price Appreciation Portfolios. These are associated with Delivered Log Market Portfolios during each projection. 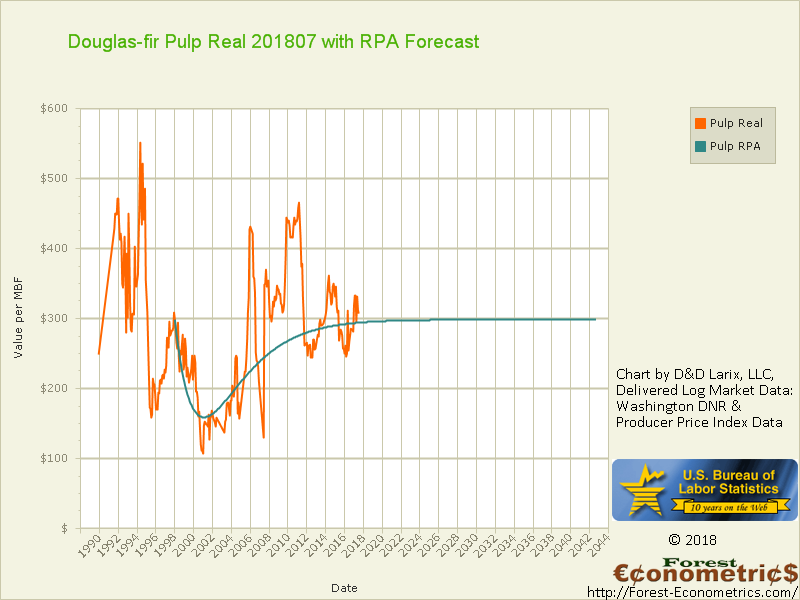 The RPA Portfolio brings price forecasting by the FRASS User into the realm of making accurate financial projections. 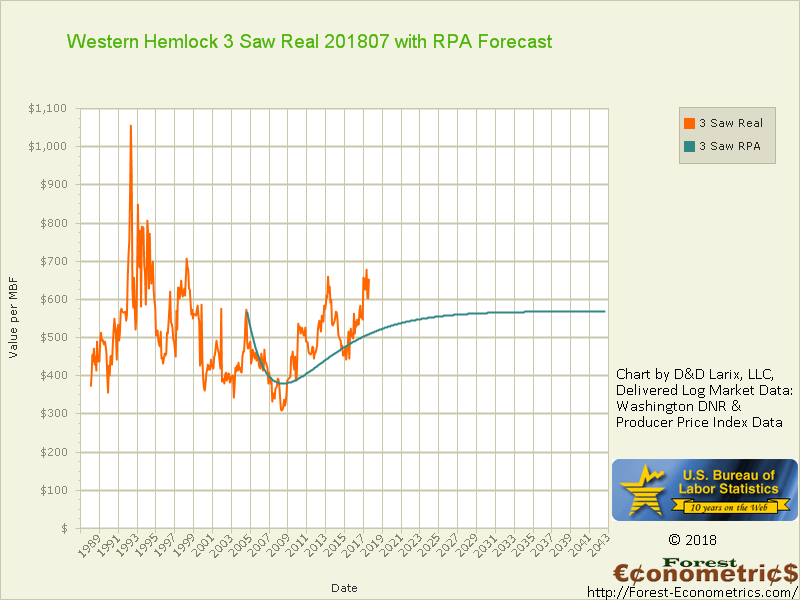 The future performance of delivered log prices is put in response to identifiable market conditions, not just inflation. History shows us that inflation has mostly been positive, causing a general increase in prices. 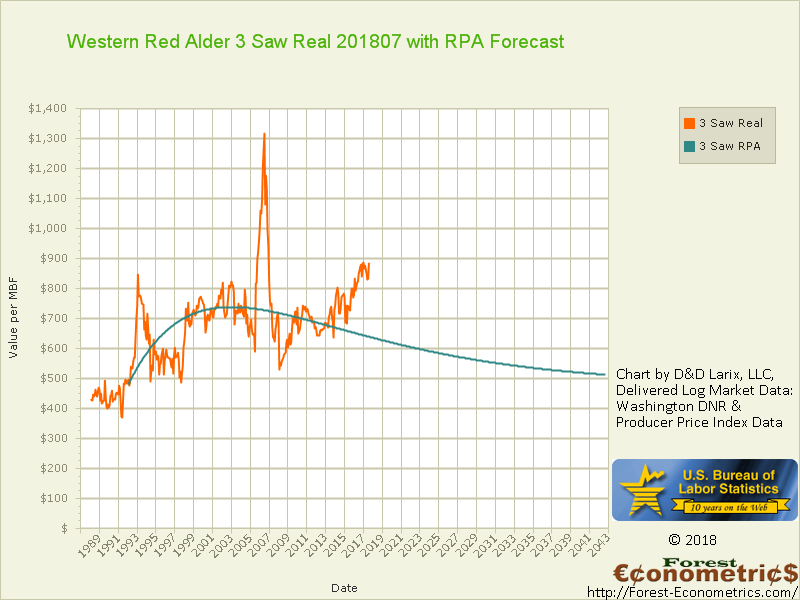 However, delivered log prices from 1994 through 2010 were generally decreasing in REAL terms. REAL prices are seen when inflation is removed from NOMINAL prices, to see commodity performance independent of inflation. When inflation is removed, prices change from NOMINAL prices to REAL or “constant prices”. We have identified a price trend initiating in 2005, devaluing, then hitting a turning point during 2009. This turning point signaled a turnaround called the “RPA Recovery Period”. This is a period when the devaluation cycle is turned into an appreciation cycle as the commodity’s price is recovered. These can only be seen in Real Terms. 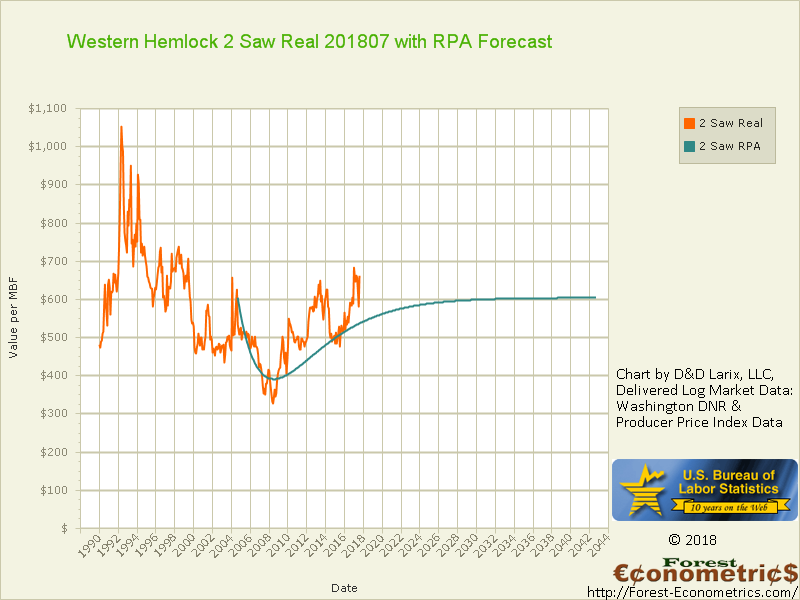 The Real Price Appreciation Forecast Tool is a fundamentally new and powerful approach to predicting delivered log market cycles. These are based on historic delivered log markets to create a price prediction horizon. We associate these with a partially observable Markov-chain continuous-time with memory model, and its particular application for performing a “random walk” model in price forecasting. 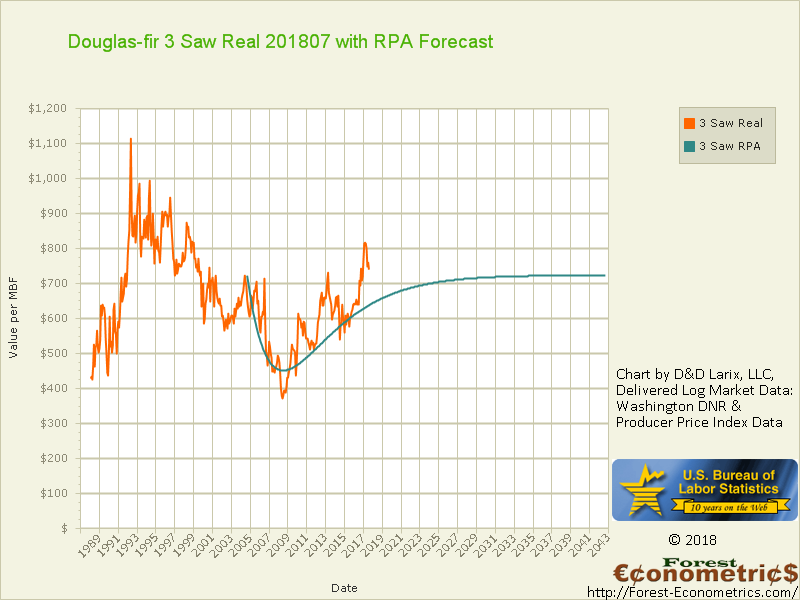 Developed for timber commodity price predictions, it is delivered only through the FRASS Platform. 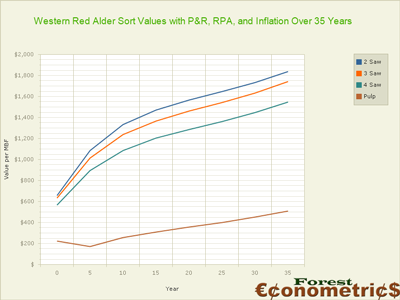 Delivered Log Market and RPA Portfolios, when applied to parcels, have substantial benefits to forestland owners and managers. When prices are rising in REAL terms, they are never rising indefinitely. When they are dropping in REAL terms, they are never dropping indefinitely. There is always a peak to rising prices, and a trough to dropping prices. 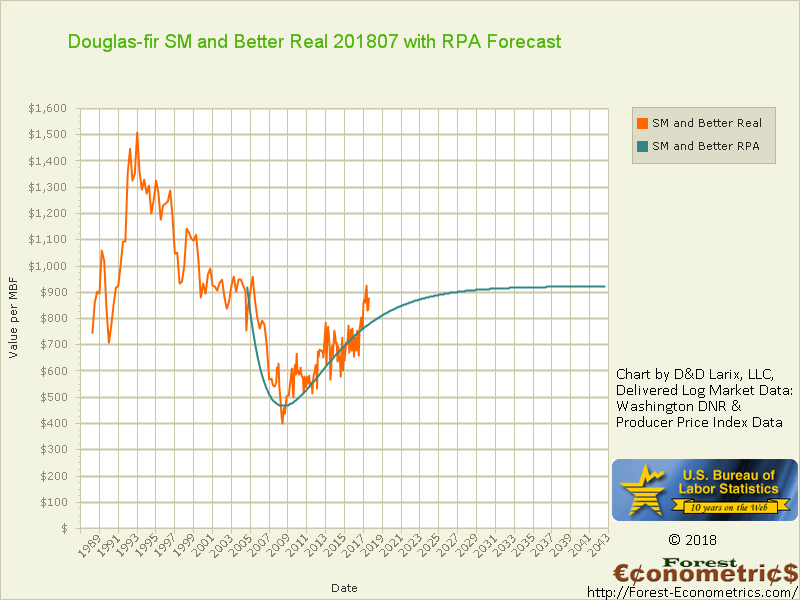 RPA prescriptions, used in FRASS, give the market planning team the ability to project future prices reliably. Benefits are seen when a timber stand is harvested later than initially anticipated to take advantage of projected climbing prices. But not too late when prices start to drop. 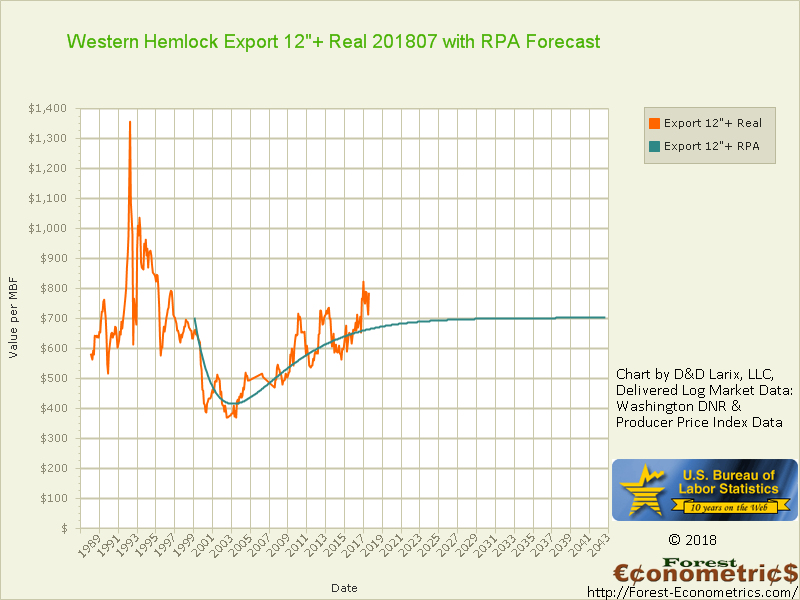 It might be seen as a timber harvest earlier than initially projected to head off a projected drop in prices. RPA prescriptions are not “crystal balls”, but they do provide insights to harvest scheduling for the forestland management team. The FRASS Platform saves Users the task of calculating hundreds of prices from log market data. Blending economic statistics with these values happens ‘on-demand’ within the Platform. FRASS Users generate these predictions with confidence. When a property’s value is generated from these economic portfolios the assumptions are summarized and integrated into the parcel report. Property values and harvest timing solutions include clear statements of all assumptions – nothing is hidden. 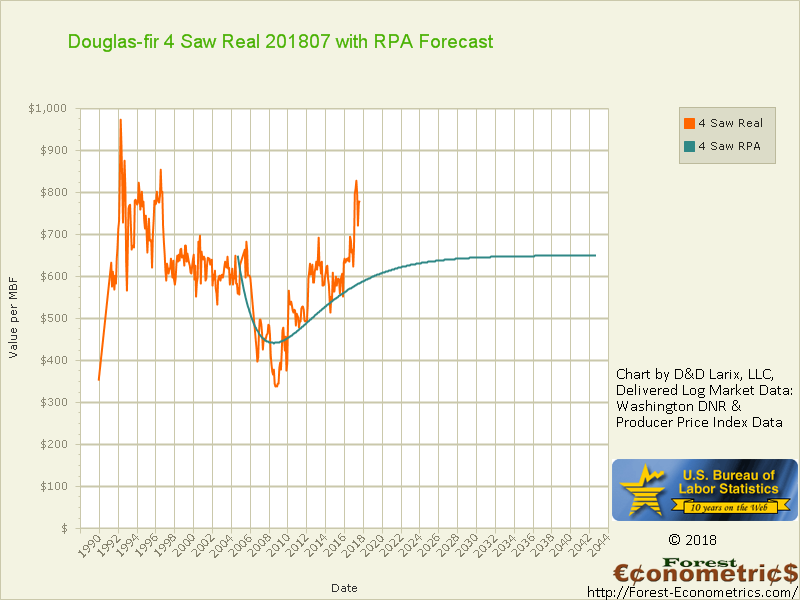 The RPA Forecast Tool delivers REAL prices in terms of ‘today’s time value of money’. That is great, but what about future prices in terms of tomorrow’s currency? FRASS does that as well! 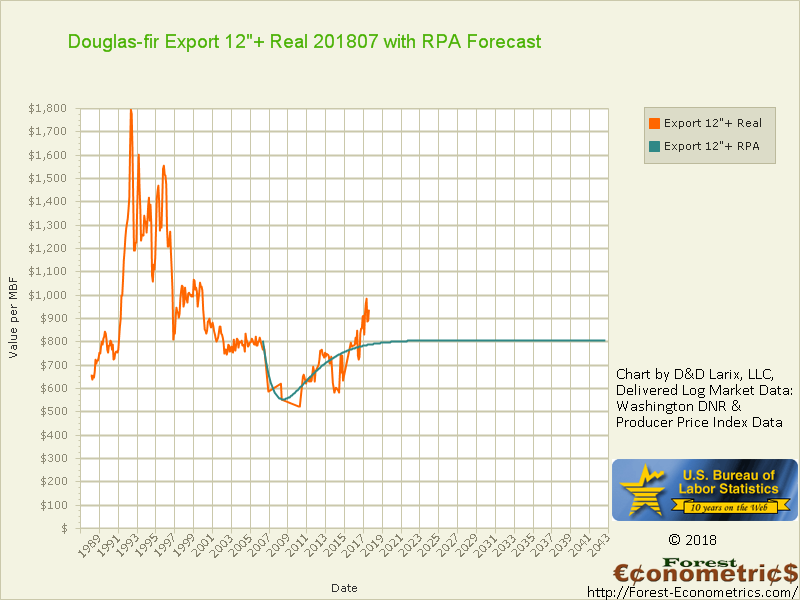 The FRASS program calculates future commodity price predictions in terms of the future value of our currency. These predictions are viewed in tabular and graphic format. 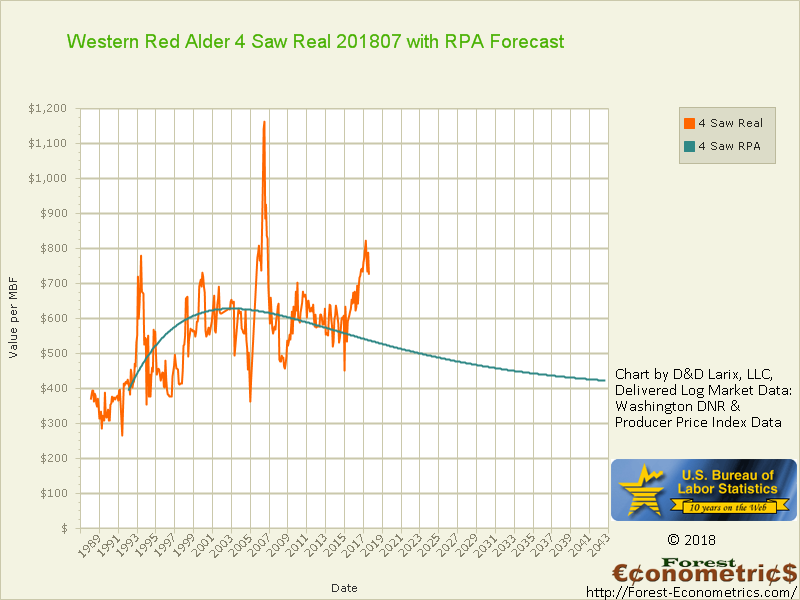 The chart shown here, is for four western red alder grades. The report begins with a 200-year price projection profile, adjusted to decreasing 5- year increment terms. Here it shows price per mbf estimates over the next 35 years in NOMINAL terms. It is fast, accurate, and graphically easy to understand. These estimates combine many factors set by the User and are generated on-demand as needed. 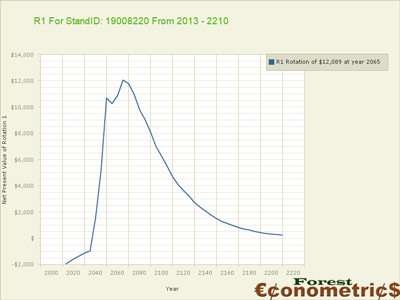 As trees grow into the future, the timber stand volumes, by sort and grade, are matched with these prices to forecast future revenue. At Forest Econometrics, we work closely with our clients to develop data and to prepare econometric forecasts in each market region. We enjoy working with our associates as meaningful data are integrated and analyzed in this Platform. Results are discovered and made meaningful to the land management experience. We encourage FRASS Users to become comfortable with the Platform, experiment with it, be creative. Ask questions, debate responses, discover solutions. Ultimately, people generate the conditions in need of response. Users compile relevant data into portfolios where they can be viewed and evaluated to generate value for every parcel in the Client’s Subscription. FRASS compiles over 200 User-defined economic variables that are applied to each timber stand, on each parcel, to generate timber harvest events into perpetuity. The FRASS program removes the need to manually compile mountains of data to generate fundamental findings of optimal timber harvest events and derived value. FRASS IS MORE THAN A PARCEL VALUATION TOOL: FRASS IS A FORESTLAND RESOURCE MANAGEMENT APPARATUS. With fundamental demonstration, the FRASS program gives Subscribers the power of insightful and strategic economic planning capabilities. What once took a team of resource economists weeks, even months, to determine, are delivered through FRASS on-demand. Due to the rapid response of the FRASS program and our computing architecture, sensitivity analysis can be quickly conducted. More important, it can be used immediately and put to action. Economic projection capabilities are combined with the physical site characteristics. This approach delivers forest management timing decisions in light of economic projections. This determine financially optimal management strategies, and brings them to light up each timber stand. Optimal timber harvest solutions, are combined one timber stand at a time. The Highest and Best Use value solution is discovered for the entire ownership. FRASS Economics is a way of thinking, of collecting data, and processing it. When you look closely at this approach you understand how it can serve you and your financial optimization goals. Contact us to begin your FRASS experience. Do it.